I saw the Niagra falls from the Canada side. They look even more spectacular from there because you can see the complete horse shoe formation. You can also see the Maid of the Mist boat in the above picture. The Maid of the Mist takes you almost till the falls and it is an experience never to be forgotten. I took the following picture from the boat. The roar of the falls was almost deafening and we were completely drenched with water. it did feel that we were in the presence of something much more powerful and immense than us ! The view from the top ! I would love to go to Niagara Falls. Breathtaking. We went on the Maid of the Mist! Took us so close we felt almost blinded by the force of the water! I was so close to Niagara falls when I lived in Ontario for a short time. I never went though. Hopefully someday. 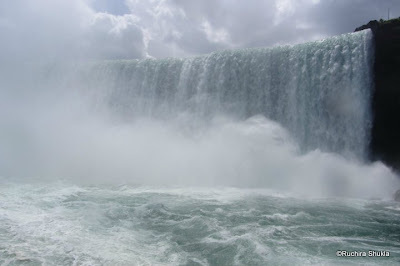 wow- Niagara has been on my bucket list; the pics are so alluring. Thanks for sharing it with us ruchira. Your blog's name incidentally is gushing stream or a waterfall right ? WOW! This must be some exhilarating and a mesmerizing experience! Nirjharini is a free flowing waterfall! Lovely pictures - such a beautiful example of Nature in all it's glory. Waterfalls do have a way of moving me too very deeply! The magic of Niagara. Beautiful. Sounds like a great experience and lovely pics. Waterfalls -- ah! I love the sound of water, the kalrav, it is so soothing! Every place I go to that has waterfalls, I am just mesmerized with their beauty. 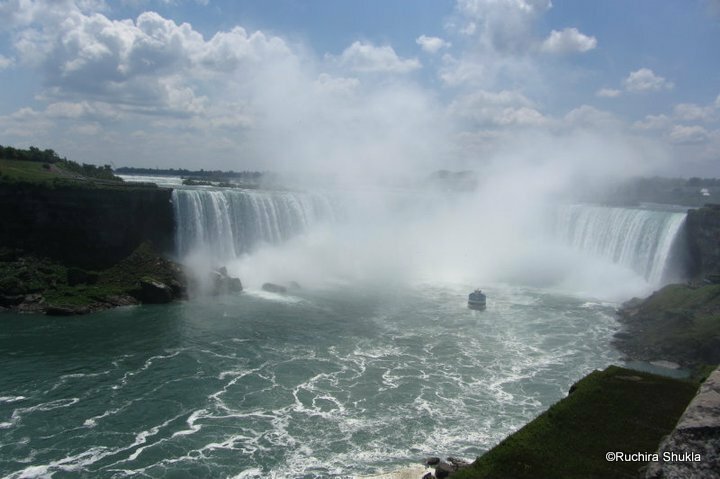 Ah Niagara -- great pics. 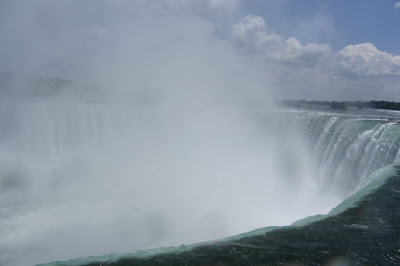 Niagara is a sight to behold and the maid of the mist is an awesome ride - a little scary though. My parents have seen the falls but I haven't. They even took the boat ride. Would love see the Niagra Falls some day. BTW missed you at the IB meet. I am sure it must have been an unforgettable experience. Some really breathtaking pictures. Now, I want to get drenched there. Great captures. Wooow! Look at those pics! Wow ! today I get to so many waterfalls by this group, I am refreshed by the end of the day ! thanks for sharing ! Your blog posting on Niagra has taken my memories back to 1975 when I stayed at your house at Lodhi colony on my way to Canada. You were just a baby on the cradle. I enjoyed about a week. I saw you and your aunty for the first time. Your aunty was about to get married that time. It gives me immense pleasure today to see the tiny girl whom I saw at that time has now grown into a a very mature member of the society. A very short but nice posting. I appreciate it very much. Yes "Nirjhorini" means a stream falling from above and your name of the blog is very much matching with the current posting. Lovely pics and yes I know what your blog name means! Nowhere as glorious as this but I remember I was mesmerized when I saw Kempty falls for the first time and then the ones in Kodaikanal. I am planning a trip but will watch from US side. Beautiful shots. Nirjharini means waterfall, am I right?